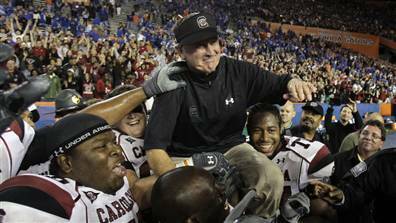 The Newest Online Source for Spurrier's Gamecocks. SITE BEST VIEWED WITH INTERNET EXPLORER & TEXT SIZE MEDIUM/NORMAL. In 2010, the Gamecocks won nine games for only the third time in school history. On the way to their nine wins, South Carolina beat Georgia, top-ranked Alabama, Tennessee, Florida in the Swamp, and Clemson. In doing so, the Gamecocks earned a tremendous amount of respect. That respect is evident by looking at the multitude of preseason polls that have the Gamecocks listed in the top 20. Another reason for the high expectations is the amount of returning talent on this football team. Not only do big names like Marcus Lattimore, Alshon Jeffery, and Stephon Gilmore return. This team is loaded with quality depth, specifically on the devensive line. Carolina's D-line should be among the best in the nation. In looking at the schedule, the Gamecocks get the reigning National Champion Auburn Tigers in Columbia. Carolina will also host Florida and Clemson. On the road, games in Athens and Knoxville will be huge in deciding Carolina's SEC East fate. Split them and the game with Florida in Columbia will most likely be for the East. Win both and the Gamecocks could possibly wrap up the East before the matchup with the Gators. It seems the only question left for the Gamecocks is whether or not they can perform with the pressure of being the hunted. Before this year, Carolina has been the perennial underdog going into the season since the Gamecocks joined the conference in 1992. This year will be different. The Gamecocks will have a target on their back. Can they handle it?